Virtuous doughnuts? Not quite, but by using low-fat yoghurt, low-fat spread and by baking them, you can cut the calories right back by over 50%. 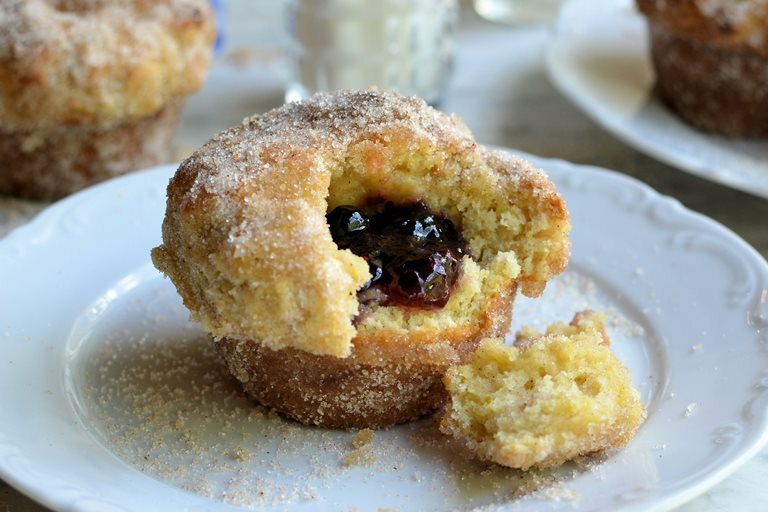 Just because you are on a diet or watching your calorie intake, doesn't mean you can’t enjoy a treat now and then……whether it be a creamy hot pudding, a chocolate bake or a chewy biscuit, it’s nice to reward yourself with a treat now and then and these baked jam doughnuts are just the thing to enjoy with a cup of tea or to pop in the office (or school) lunchbox. 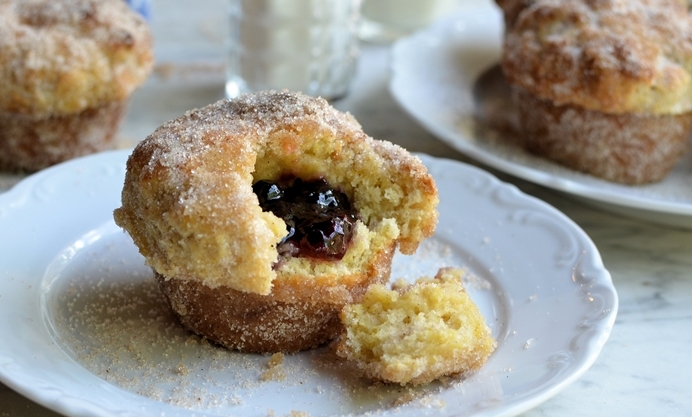 I’ve made these many times before, but not the “lightened up” version I am sharing today; think doughnuts but muffins, and you will have an idea of the type of bake they are. They are yeast free and not fried, and to make them easy to bake, you use a muffin pan/tin to “shape” them. I used a very high fruit and therefore low sugar jam in these “diet” versions and although they still have 180 calories in each doughnut, they are considerably lower in calories than the fried and yeasted versions, that have an average of 400 to 500 calories each. By using low-fat yoghurt and low-fat spread in the recipe, as well as low-sugar jam and by baking them, you can cut the calories right back by over 50%. Add some ground cinnamon to the sugar finish and you add an extra flavour dimension. I have made these with many jam flavours - raspberry, strawberry, cherry, lemon curd and mixed berry, but, my favourite jam flavouring has to be a tangy raspberry, and it’s that flavour that I am suggesting in today’s recipe. So, as you can see, a couple of biscuits are higher in calories than a lovely, freshly baked jammy doughnut…..and you will have less salt and no additives in them too - they really are a lovely lower-calorie and a better treat than a handful of biscuits or a chocolate bar.